Tiger Woods starts his victory celebration with caddie Joe LaCava. The roar has been restored. Tiger Woods produced one of sports most historic comebacks on a magical Sunday at a magical place. 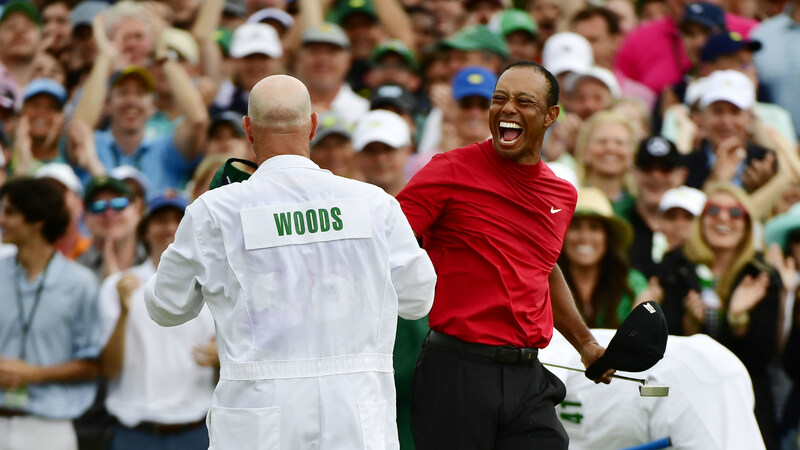 Woods relied on his experience and grit to take down a swarm of would-be champions at the Augusta National Golf Club to win his first major in 11 years and his first Masters in 14 years. He did it with patience, superior shot-making and the calm in the face of immense pressure that only a man with 14 major championships could handle. When the contenders around him were crumbling, Woods came through with birdies at the 13th, 15th then a near-ace at the 16th to build up a two-shot lead that he would need. Ahead of him, the new generation wasn’t up to the task, they crumbled the way players did in Woods’ prime more than 20 years ago. Brooks Koepka had great looks at birdie at the 17 and 18th holes, the one at 18 was from just outside 10 feet and he’d miss, allowing Woods the luxury of a two-shot lead and he’d need it. Tiger’s drive at 18 wasn’t good enough to clear the corner. He came up short, pitched to 12 feet and all he needed was a two-putt for his 15th major and fifth Green Jacket. He got it, shot 70 and finished at 13-under, one huge stroke in front of Koepka, Dustin Johnson and Xander Schauffele. Woods tapped in from inside two feet and let out a roar and began his celebration that started with caddie Joe Lacava then went to son Charlie, mom Kultida and daughter Sam. Tiger headed for the clubhouse hand-in-hand with Charlie in tow. For the record, he shot rounds of 70-68-67-70 for his 275 total to get his 81st win and perhaps the most rewarding, if not the biggest of his storied career. After Dustin Johnson posted 12-under, it left Molinari, Koepka and Schauffele to try and catch Woods. Schauffele blew his chances when he failed to birdie 15. Woods proceeded to birdie 13 and 15, notching both par fives, something all champions do over the final nine. Woods then elevated himself to 14-under with a sensational eight-iron into the par three 16th that nearly went in for ace. Woods marched off that green with the old Tiger Woods look in his eyes and he had that winner’s intent. When Koepka couldn’t make his birdies at 17 and 18, he left the door wide open and Woods gladly walked through it. Woods was most proud of how he worked his way around the course he knows better than any player in the field. “I was patient as I’ve been in a lot of years. I plodded my way around. To see the leaderboard — it was a who’s who.” He remembered his earth-shattering win in 1997 and recalled — “My dad was there in 1997, now I’m a dad, I’ve gone full circle. I was pretty lucky to be playing again,” he said, recalling his physical struggles of the past three years. Those struggles, the surgeries, the rehab, the work he has done to restore his game are the stuff legends are made of. Oh yeah, it sure does. With that bit of hilarious-ness — the chase —which seemingly only I believed was always still on, is back on for everyone else. Nice to have some company again. First, all the men in contention showed something special. From Brooks and Molinari backing their major successes. Tony and Xander continually showing the real effect of Tiger woods, which is more than just influencing white golfers getting fittter, but actually bringing the world some world class golf with various shades of skin and backgrounds. This international and cross cultural influence is the best part about tiger which in some ways has barely just begun to show itself, for now thru these two awesome cats. I personally cannot wait for these two to start their major counts; as I have done for many years with tiger I assure you majors are coming for X and T. Jay day comes to mind as well. But as great as all these golfers are what we all know today is they are still no Tiger Woods. Baxter, you should be a college professor….anyway, Koepka, Moli and the rest choked their guts out, they laid down for Tiger the way guys used to 20 years ago…especially Koepka, the majors monster, that putt at 18 wasn’t that difficult and Woods admitted afterward that Koepka was the guy he was keeping an eye on. As for Molinari, worst playing of the 15th hole I’ve seen in a long time in the final round…..he was choking his gonads off. Simple as that,l you are PhD analytical, I’m real world, remembering times when I choked and times when I saw other guys choke around me….it’s pretty easy to recognize. I’ll take the professor comment that as a backhanded complement. That is a possibility but I’d rather profess first tee classes these days. For me it was simple: the genius of 12. I don’t believe everyone chocked. Had all those boys laid the sod with their thirds, then I would cry chokes. The discipline required not chase that right flag is ridiculous; still blows my mind Mr Jones ever considered the 9s in reverse order. It’s just so perfect the way it is. Tiger was helped immensely in seeing all these watery graves. Even the most stubborn of golfer would play the smart shot at that point. I do believe tiger was under such control he was going to find a way; the events at 12 happened to be the way it went down. Brooks missed putt at 18 was not so easy. I was on that green last Sunday; the green itself was unrecognizable from previous years. I was scratching my head until I heard it was resurfaced. Tiger thought his par putt would go left. Brooks is a beast with clearly very little choke-ability; better than most imo, except for maybe one man. I always say this the guys whom choked last are still lesser chokers than all the guys who choked it away the first 3 days. Choking is choking and there was a lot of choking going on…..that layup by Molinari at 15? Pure gag city…..
U know that Molinari wedge shot at 15 unexpectedly hit a branch? U see the limb fall.